Google Chrome can show suggestions for the page you were trying to reach, if it is unable to connect to the web address, and you will see suggestions to navigate on other parts of that site or search on google instead. That is a problem that can be fixed with clearing the cache and cookies and deselecting an option called “Use a web service to help resolve navigation errors” on the chrome settings. 1. Make sure that the page is down just for you or for everyone , you can check that in here , and if it’s down just for your computer , you can go on to the other steps. 2. Go to chrome and click on wrench menu >settings and scroll down and click on Show advanced settings and click on clear browsing data button. 3. 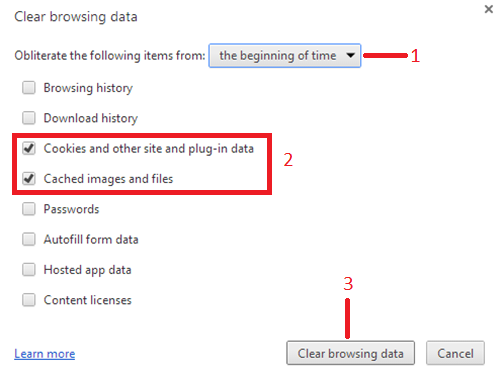 On the windows that will appear select “beggining of the time” and select only “Cookies and other site and plug-in data” and “Cached images and files” and click clear again. 4. Again at the wrench menu scroll down a little bit more and make sure to deselect “Use a web service to help resolve navigation errors”. 5. Now restart your computer and try to load that page again. Warning: if this method doesn’t work with your computer it may be an problem witht your ISP in your location. Why is (C:) the Default Hard-Drive Letter?